Interstices across Manchester: Twitter: What is it good for? Facebook is for friends, LinkedIn is for business connections and Flickr is for photographs. But what’s Twitter for? It’s something that every new Twitter user struggles with and if I had a penny for every time I’ve heard, ‘but my life just isn’t that interesting’ or, ‘why would anyone want to know what I had for breakfast’, I’d have quite a nice car by now. And the money to pay for the lessons which would allow me to legally drive the thing. Twitter’s trouble is that it’s purpose is too vague; there’s no clear USP for new users. It’s not just for friends (because anyone can follow you). It’s not for pictures (because you can’t upload them directly onto the website). It’s not for work (You can’t write that much about yourself in the profile box). New users have no idea what the point is and, more importantly, how to use the thing properly. Facebook lays out the rules straight off the bat. “Facebook helps you connect and share with the people in your life,” proclaims its homepage. LinkedIn does a similar job. “Use LinkedIn to exchange information, ideas and opportunities,” states the landing page of the professional network. In one sentence, users are presented with a road map for their time on each of these sites. They understand what each site does and the purpose is serves. When it comes to Twitter, new users struggle to understand this purpose. The earliest Twitter strapline, presented under the logo, offered little clues as to the point of it all. ‘What are you doing?’ it asked. ‘Why should anyone care what I’m doing?’ we replied. And this position, this open-ended question, has haunted Twitter ever since. Despite a new strapline, defining the purpose of the site (Share and discover what’s happening right now, anywhere in the world - 2009), new users found it difficult to get their heads around this concept; the idea of random people being interested in the mundane. The idea of random people across the globe being interested in the mundane was even more difficult to imagine. To some, it was an intimidating prospect. 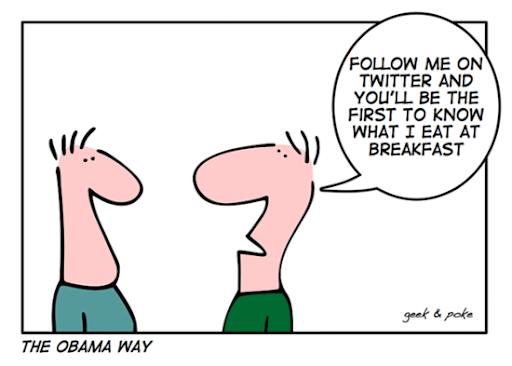 In 2011, Twitter attempted to reposition its appeal yet again with a new motto, ‘Follow your interests’. Better. Of course, Twitter isn’t about that. It’s about sharing knowledge, news and information. Getting involved in subjects you feel passionate about and contributing to a wider conversation. The versatility of the platform, the number of different ways you can use it - which has been the site’s trump card to date - is also the reason why more users haven’t signed up for an account. The company just hasn't made it clear what users are meant to do once they're in the club. And this is why the stereotype exists. It's also good for pestering Z-list celebrities. And finding funny one-liners. I also get a large portion of my blog hits from Twitter, just by providing links. I'm starting to sway more towards Twitter and away from Facebook. Maybe I'm getting old.